On July 7, activists of the Kiev branch of the Association organized an active holiday on catamarans. 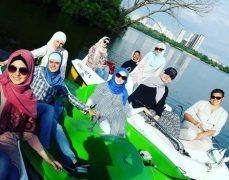 Particular attention was paid to new girls, who have converted to Islam recently and started to observe the Shari’ah rules, in order to strengthen them in the path of Islam. Such a collective holiday has become a good tradition for the organization. It strengthens sister relationship and unites Muslim women. This is important in a non-Muslim society when every day is a struggle with stereotypes.